Given the crash course in plant pollination that everyone has had since CCD reared its ugly head in the US, it seems kind of silly to have to say it. Of course bees matter. Yet, that’s what a group of Ontario farm organizations “and the agricultural industry that supports them” felt the burning need to say on the weekend. And say it loudly they did: “An Open Letter to Ontarions. Getting the Facts Straight on Honey Bees” ran as a full-page ad in many daily newspapers (including the Kingston Whig-Standard and the Globe & Mail) on Saturday. The Grain Farms of Ontario, Ontario Canola Growers, Ontario Fruit & Vegetable Growers Association, Ontario Bean Growers, Farm & Food Care Ontario and the Seed Corn Growers of Ontario are all vehemently opposed to any restrictions being imposed on their use of neonicotinoid pesticides. They’re desperate for the people of Ontario to know that the honey industry is doing just fine and there’s simply no need to limit their use of deadly chemicals on your food crops and they have pretty graphs and research to back it up! It looks great, doesn’t it? I guess that’s that, case closed. Yeah, no. The complete dishonesty of using the total number of colonies for each year to demonstrate the health of the industry takes my breath away. It does look pretty good that the total number of hives in Ontario grew from about 70,000 to around 110,000 in only 11 years. BUT, that chart completely disregards the number of colonies that died and had to be replaced in any given year! The Canadian Association of Professional Apiculturists publishes an annual tally of the number of hives lost over the previous winter. According to the 2014 statement, covering the winter of 2013/2014, 58% of the honey bee colonies that went into winter in Fall 2013 did not survive. 58%! 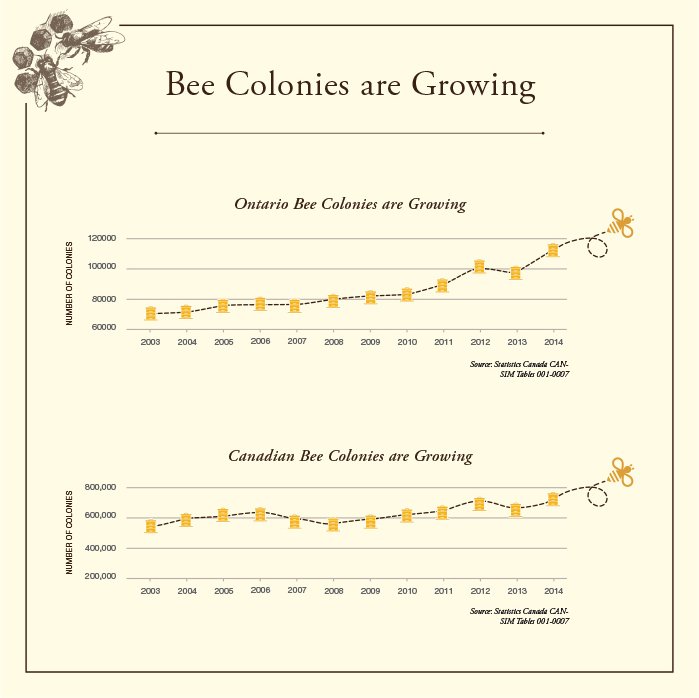 But according to the chart above, there were about 95,000 colonies in Ontario in 2013 and that rose to around 110,000 the following year. That’s not an indicator of a healthy industry, that’s a testament to the bloody-mindedness of beekeepers. Not only did we have to replace 58,000 hives that died the previous winter, we added an extra 10,000. Now, don’t get me wrong: I’m absolutely not blaming pesticides for winter losses. There are many factors at play. 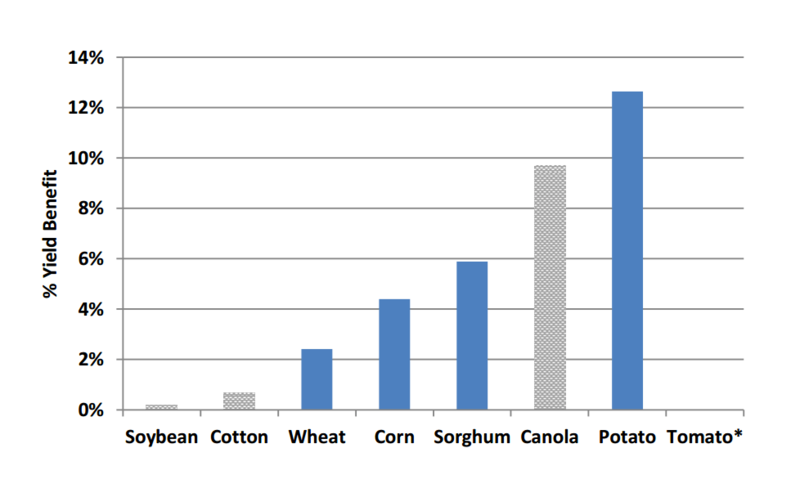 But, but only using some of the available data, the Grain Farmers et. al are trying to pull the wool over your eyes. Ask a beef farmer: if he lost almost 60% of his herd in one winter what would be do? A chicken farmer? A goat farmer? They’d go bankrupt is what would happen! Interestingly, they also link to some research that “proves” how vital neonicotinoid pesticides are to their business model. On the surface it looks compelling. It’s a meta-analysis of a number of studies looking for a trend amongst them that might point to neonics having a positive effect on crop yields. It’s also no surprise that they find one too. The research was sponsored by Bayer CropScience, Syngenta and Valent in support of regulatory review processes in the United States and Canada, with Mitsui providing additional support for the turf and ornamental studies. Valent and Mitsui are smaller players in the world of agri-chemicals. So, the research was bought and paid for by the companies that make the chemicals that are supposed to dramatically increase crop yields precisely for the use of the companies to influence government processes that could threaten their business model. When you throw in the fact that Growing Matters, the site that hosts this research paper, is owned by Bayer/Syngenta/Valent and has little else but agri-chemical industry propaganda the utter nonsense of the whole exercise is laid bare. The Ontario farm organizations that are supposedly behind this campaign have been duped. The truth is that these synthetic chemicals aren’t needed on family farms. The industry’s own research proves it. The farm orgs’ names are there for nothing more than window dressing and to lend some credibility to an argument that’s clearly losing. The Farmers are just trying to make a living and they’ve been hearing pie in the sky promises from pesticide makers for years. It’s sad really. There’s a revolt brewing amongst the GFO’s membership and the loss of credibility that’s sure to come from participating in an exercise like this could mark the end of the organization. Which is really too bad. Family farmers need a voice, but that voice must be well-informed and critical of everything that they’re told. Clearly, they haven’t been in this case. Very nice Gord. What Kyle said. Reading it, the old saying came to mind: “You can have more bees, or you can have more honey; you can’t have both.” 68,000 new hives meant 68,000 hives not producing a honey surplus. Likely more than that as some number of them probably came from splits, taking the donor hive out of honey production that year also.